The battle over “platforms” is as frenzied and vital as a presidential campaign. It has become impossible to escape the smartphone wars. 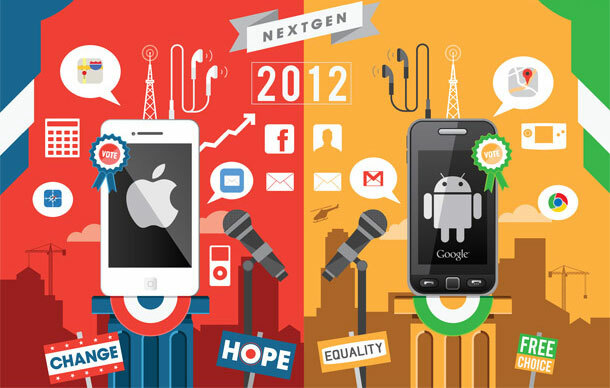 Every day there is another infographic about the race for dominance between Android and iPhone. It has the feel of a political campaign, with the two major parties duking it out for 2012. Is there room for a third party? 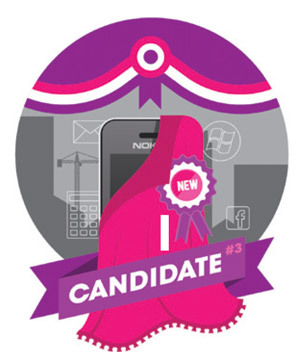 Is the Nokia-Microsoft team a political also ran? When I first heard that announcement, I thought of Kerry and Edwards, not Google and Apple. Imagine Steve Ballmer in a David Plouffe-like role as the true mastermind of this political deal. You may think that I am exaggerating. But these politics are deadly serious, with billions in market cap at stake. The drama plays out most clearly not in the public commons, but in the corporate boardroom. Platform strategy has become the new way technology companies set their agenda. You can mark the rise and fall of executives and divisions by how they play the New Politics of Platforms. Enormous power comes from naming a new Platform within these environments. Again and again, I have seen someone well-placed become the champion of the “Next Generation” Platform strategy (often just a repackaging of what the company already has) within an organization. With this simple political act (warning: Do not try this unless you have significant political capital to spend), you can seize control (directly or indirectly) of major elements of an organization’s strategy. Product road maps are realigned to better anticipate and integrate with the future Platform (now referred to as “Next Gen”). Products are canceled outright if they do not embrace the new political reality. Significant budgets are allocated to consultants who lavish huge amounts of praise on the new corporate “champion.” A war chest for acquiring promising tech startups magically appears. Marketing teams spin new names and brands. Agencies salivate. People start to get nervous if they are not invited to Next Gen off-site “planning sessions.” The CEO is heard saying that this is “the most important initiative in the company.” Pretty soon, few strategic decisions can be made without the Next Gen Champion’s personal blessing. “But, what does that mean for our Platform strategy? I don’t know. Have you asked Joe who is in charge of Next Gen?” As the Next Gen Platform increases in popularity, the stakes rise as well. Key constituents (such as IT or customer care organizations) must be wooed. So campaign promises are made. Certain products will be featured on the home screen. Certain technologies will be used. Optimistic timelines are set (and missed) for a Christmas 2012 release, or for a Flash demo to the board of directors. The politics extend outside the company too. His advisers eventually inform our Next Gen Champion that a Platform is useless without the support of legions of outside developers. (Why didn’t they tell him sooner?) So he begins to court “the Left” (the open-software-development community) without disrupting “the Right” (entrenched partners and suppliers who fear the costs of Platform change). This unpredictable crowd must be courted with lavish parties at developer events. Suddenly, Linux is a penguin, and Android is a cute green robot to be plastered on T-shirts, mugs, and elaborate laptop cases. In a bold move, Verizon decides that Droid is a Terminator-style robot instead, straight out of the PS3. And then something funny happens: the Next Gen Champion starts to sense that doubts are emerging about his Platform strategy. He talks to his key reports and finds out that many things he promised are now set for Release 2.0 (our candidate is a one-termer–he just doesn’t know it yet). Change orders are piling up from the political consultants (IBM, Accenture). Budgets are out of whack, and alternate strategies are being explored. (Maybe we should just go with Android instead?) Suddenly, Next Gen is not really next gen. It is just the same old broken code base with some patches and enhancements. The efforts shift to “pushing it out the door” and “hoping for the best.” The political honeymoon is over, and everyone heads for cover. There’s a “New Next Gen,” and of course that’s where it’s really at. What’s fascinating about these politics is that they usually play out with no real connection to what the technology can accomplish. A Platform can mean anything you like. It is only a rhetorical device. Who can argue against the seamless integration of your products and services? Who can argue against the development of shared capabilities? Who can argue against a new eco-system of app developers? These days, everything is a Platform, from customer care to e-commerce. What any of that really means is lost on most business managers, who spend their days “campaigning” for the latest Platform through PPT decks and conference calls. A Platform is really, after all, just that: a platform. What were you expecting? Why would you believe the politicians anyway?